In early 2011, America’s economy was still reeling from the great recession of 2008. But our nation’s deep and systemic income inequality was a subject yet to be seriously confronted on the national stage. Then, in February, 100,000 Americans–many of them inspired by the recent uprisings of the Arab Spring–swarmed the Wisconsin state Capitol to protest a new law curbing union rights and lowering pay for public workers. The demonstrators ended up staying for months, setting the spark for a movement that continues to define today’s American Conversation. Prominent activist Van Jones was one of the many progressives who believed that Wall St. and the GOP were selling a false bill of goods to the American people–asking the middle class to tighten their belts as the richest 1% raked in record profits. 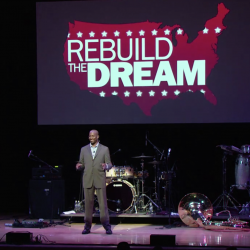 So he founded Rebuild the Dream, a people-powered movement whose earliest aim was to expose the roots of America’s income inequality and chart the way forward toward a vital and fair economy for all. 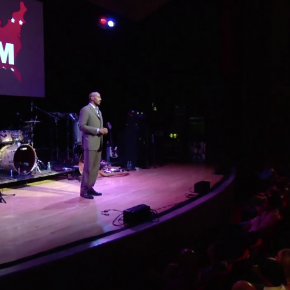 Van partnered with MoveOn and ART NOT WAR to launch Rebuild the Dream as boldly as possible. 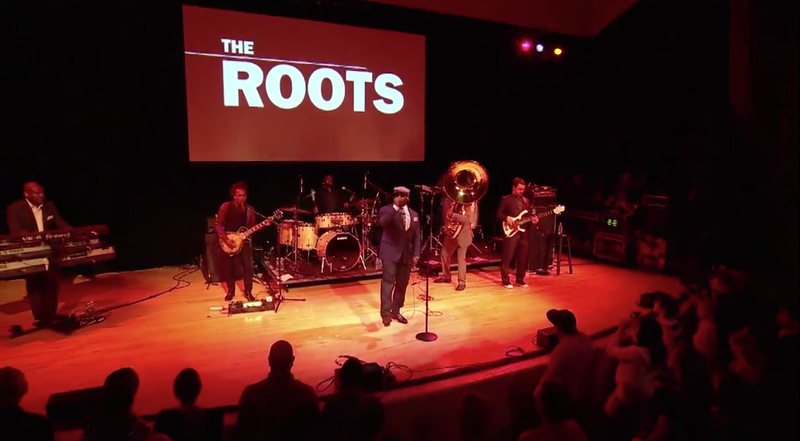 Once ART NOT WAR booked the historic Town Hall theater in New York City for a June 23rd premiere event, we started our buzz-building campaign with a tip of the hat to underground revolutionaries everywhere. 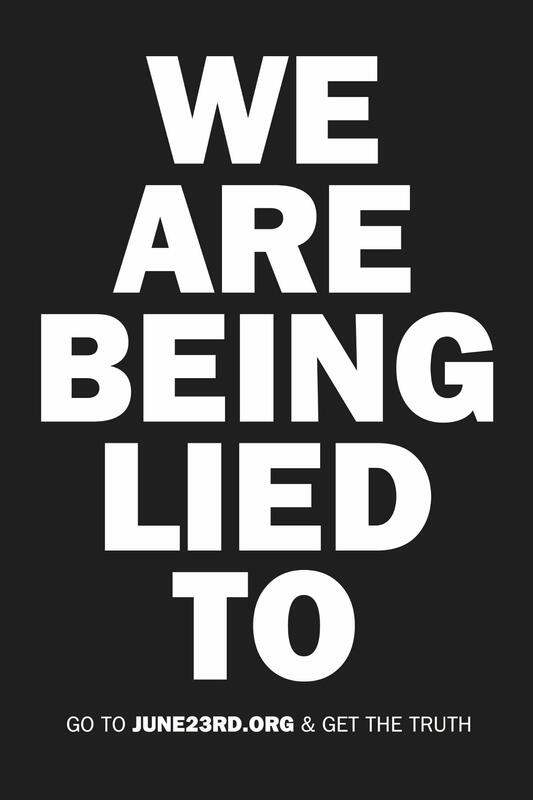 First we commissioned cutting edge graphic artist Yoshi Sodeoka to create a provocative poster reading, “We Are Being Lied To” which we used in a sniping campaign throughout New York and Los Angeles. The posters contained a url leading to a mysterious website containing nothing but date of our event. Next we created and released a digitally doctored “hoax” video, ostensibly shot by an anonymous activist, showing the Fox News ticker in Times Square being hacked to display information from Rebuild’s “Contract for the American Dream.” The video generated tremendous buzz online. Millions of viewers believed the hack was real while thousands more debated it online. Our next action was a march on Wall St. in collaboration with direct action group the Other 98%. We filmed a large band of activists preparing for and engaging in a surprise protest on the steps of Wall Street’s Federal Hall. 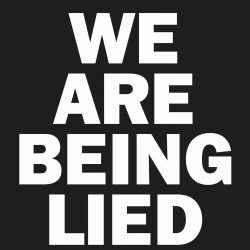 Our video of the action shows demonstrators gathering defiantly at the site of George Washington’s inauguration, then flipping their protest signs to reveal “We Are Being Lied To” in huge letters. 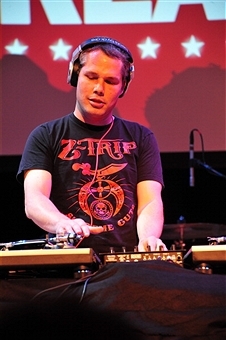 Like our posters, the video led viewers to our event’s web site, now with full details in an invitation designed by legendary artist Shepard Fairey. 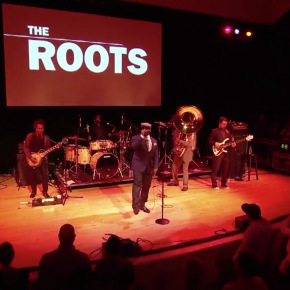 After working with Van Jones to craft his speech for Town Hall, ART NOT WAR secured hip hop icons The Roots to perform live. 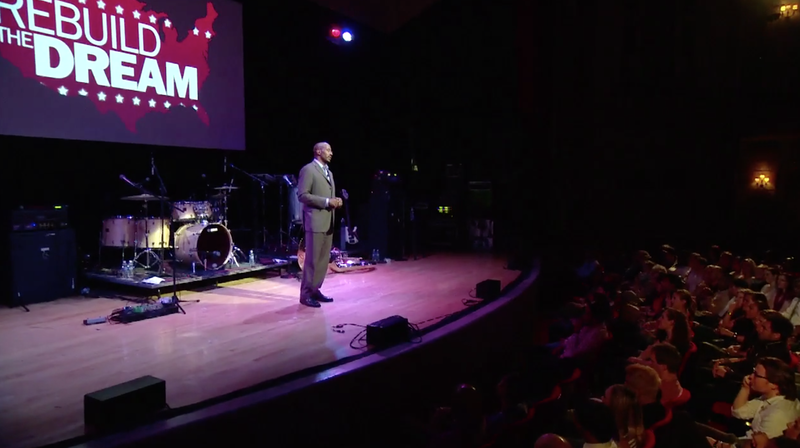 We worked with MoveOn to ensure Town Hall was sold out. 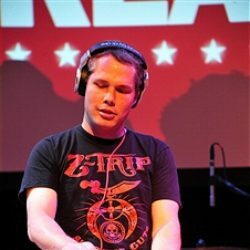 We negotiated a deal with Livestream that put the program in front of three million viewers online. And on the night of the event we produced the entire run of show, featuring a five camera shoot that included a crane and two jibs. Before the evening came to a close, we had edited and released a series of shareable video clips to amplify the event on social media. 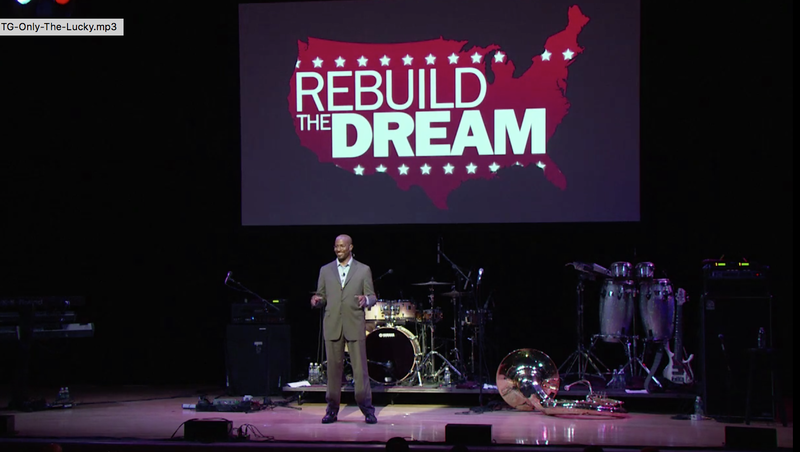 The Rebuild the Dream event was a huge success, covered by all major press outlets and buzzed about on social media for weeks after the campaign’s conclusion. 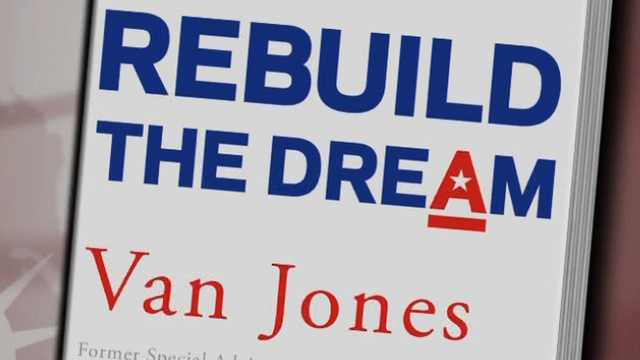 After our night at Town Hall, Rebuild became a fully funded organization and started the next chapter in Van’s journey as a progressive leader (and now a commentator on CNN). Just three months later, on September 17, a group of activists entered Zuccotti Park in what would become the largest protest against income inequality our country had ever known–Occupy Wall St.
And before the year was over, on December 6, 2011, Barack Obama walked into a high school gym in Oswatomie, Kansas to deliver his defining speech on income inequality. If you listened carefully, it seemed totally reasonable that, to prepare for his speech, the President may have at least spent a few minutes watching the video of an inspiring and game changing event that happened that summer on June 23.